While the Baked White Beans with Garlic, Lemon, and Herbs takes an hour and half to bake, it doesn’t take that long to prep. I have become used to cooking my own beans on the stovetop, and routinely cook a big batch, freezing them in 1.5 cups portions with the bean cooking liquid. This way, when a recipe calls for a can of beans, I have exactly what I need in my freezer. I also have canned beans for all my emergency bean needs because as I am learning, my freezer isn’t actually that big. 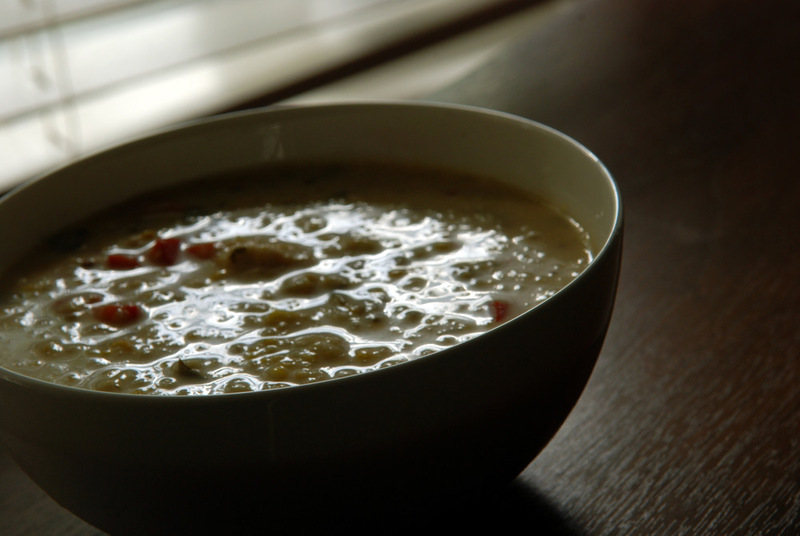 This is a super quick soup, courtesy of Tess and thus literally bursting with flavour. White beans, kale and a host of flavours (garlic, lemon, celery seed, dill) are combined for delicious results. While you usually have to simmer a soup for complex flavours, here you only have to blend and heat. Almost an instant soup. With a dirty blender and a pot. I adapted it from Radiance 4 Life, by increasing the kale and using lemon pepper for extra zing. Funnily enough, I hate celery but don’t mind celery seeds and thought they helped create many levels of flavour. 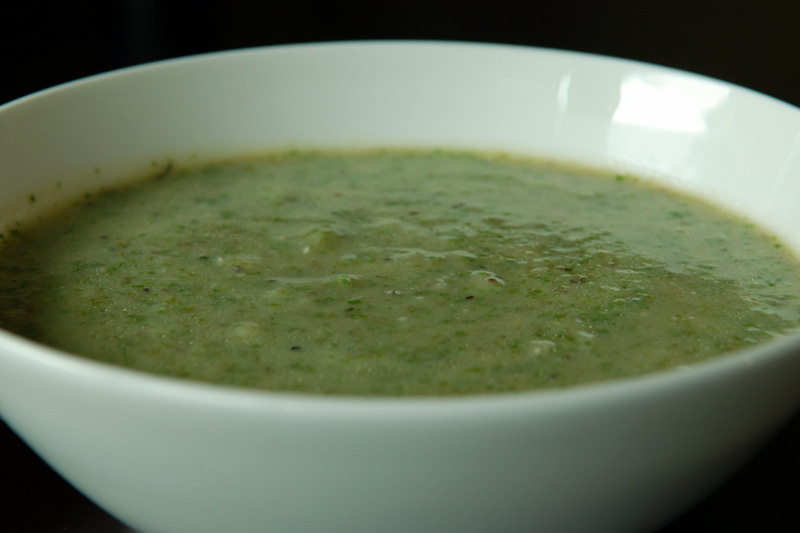 The balsamic vinegar works well for the soup as well, but it makes the soup a bit murky. If you have white balsamic vinegar, this would be the time to use it. This is my submission to Deb for this week’s Souper Sundays and to this week’s Wellness Weekends. 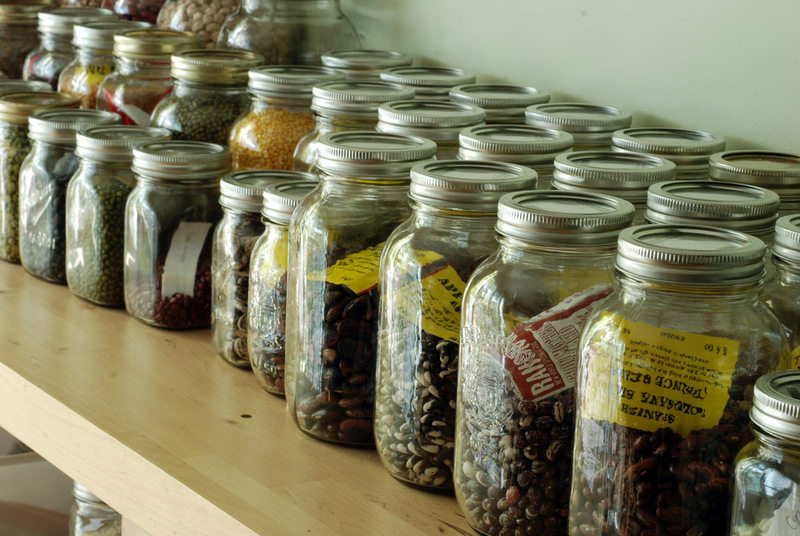 If you could pick only 4 dried spices to have your kitchen, what would they be? For me, perhaps cumin, cinnamon, Aleppo chili flakes and bay leaves. I use these ingredients a lot and feel out of place if I have to work in a kitchen without them. Funnily enough, they aren’t your typical spices found in a North American kitchen. My friend recently visited and requested that we cook together. She wanted to learn how to cook more like me, ie, more healthy, vegetarian cooking. Of course, I can easily whip up healthy recipes with my own pantry staples, but I wanted to work with what she had in her kitchen. I immediately wanted to know what kind of equipment she had. No food processor nor spice grinder, but she thinks she has a Magic bullet. Next, I needed to know what spices she had. She had to get back to me, she couldn’t remember. Turns out, she had four: cumin, turmeric, bay leaves and curry powder. Of all the spices, what a wonderful selection! I could breathe more easily.. I could whip out my cumin recipes! And bean recipes! I gave her a menu, with a multitude of possibilities that worked within her kitchen constraints as well as her own prep constraints. She told me she didn’t want to do a lot of chopping, not a lot of prep time, focusing on hearty dishes with beans and root vegetables, and she likes zucchini and eggplant. Turns out I had made a killer dal recipe earlier that week from Julia’s Vegan Kitchen (adapted from Indian Home Cooking‘s recipe), so I was tickled pink when she picked it as the meal she wanted to make together. While I originally made this simple dal with split yellow peas, red lentils are better for quick meals. Red lentils are a great choice for bean newbies since they don’t need any pre-soaking and cook up in under half an hour. Therefore, I used red lentils with my friend. 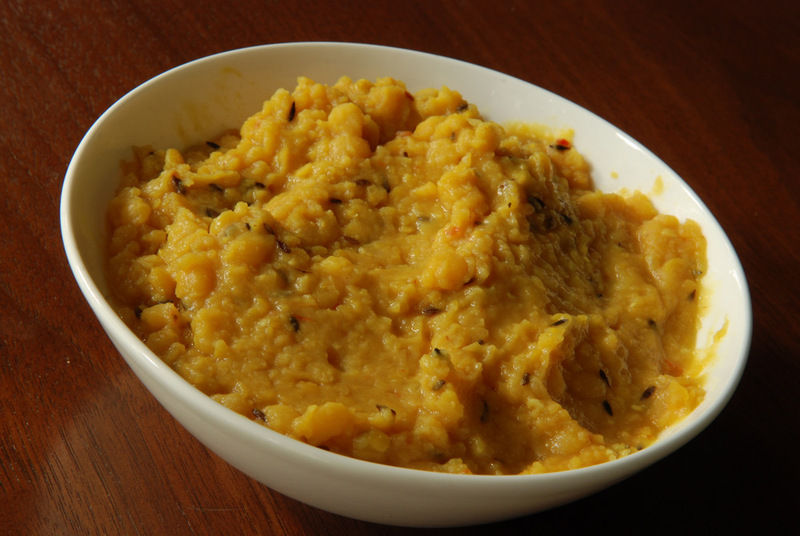 Despite a seemingly short ingredient list, this is a really flavourful dal. With the right cooking techniques, you can make the flavours pop. The trick is the heighten the flavour with a little simmering of the spices in oil that you add at the end of cooking. In fact, everyone was smitten by how easy, flavourful and healthy this meal was. It will definitely be added to our regular rotation of no-think, pantry-friendly recipes. What are your your favourite no-think quick, healthy vegan recipes? This is being submitted to this week’s Weekend Herb Blogging, hosted by Winnie from Healthy Green Kitchen. Thank you for all your suggestions on how you bookmark your recipes on my last post. For some reason, Google Reader doesn’t always search every post, so sometimes I resort to searching through the archives of my favourite blogs. We all know the heavy hitters in the food blogging circles. We could argue about our top 3 blogs, but I enjoy Heidi’s blog at 101 Cookbooks and have had success with many of her creations. Even after 3 cookbooks to her name, she continues to post recipes that feature fresh and natural ingredients. One of the benefits of having a blog, instead of her cookbooks, is that it is quickly and easily searchable. When I wanted to know what to do with some leftover dill, I looked through her archives for inspiration. 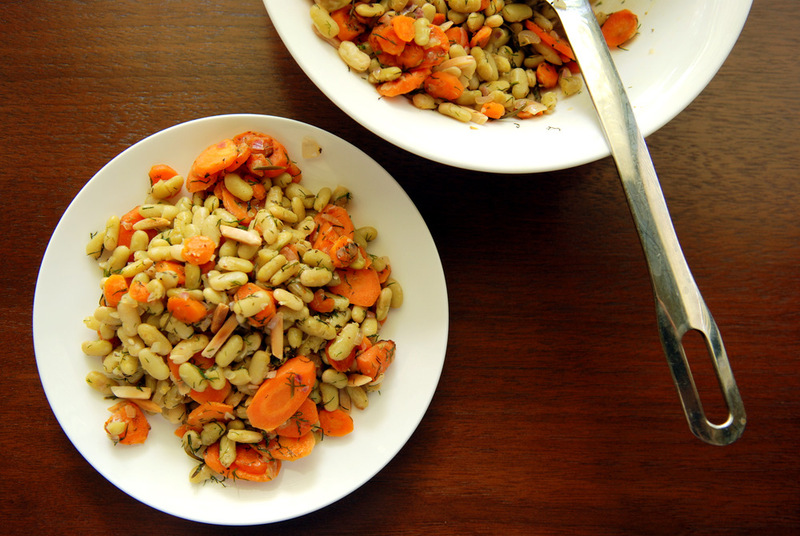 I eventually settled on this seemingly simple white bean and carrot salad. It is simple to make but the flavours work really well together. This is definitely where food synergy is at play. I added my own spins to the dish, adding more carrots, using less oil and no sugar. Instead, I opted to caramelize the shallots and carrots to capitalize on their natural sweetness. Slivered almonds confer a satisfying crunch. 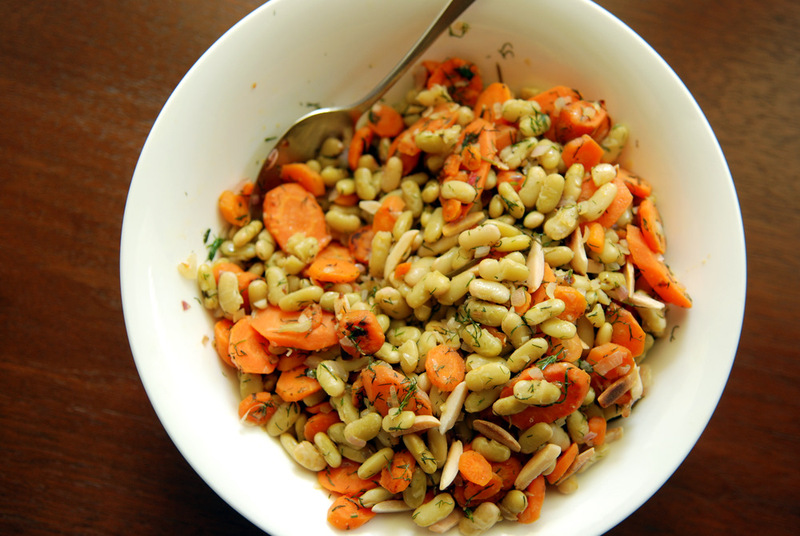 I froze extra flageolet beans from my last flageolet bean salad, so this was easy to whip together. 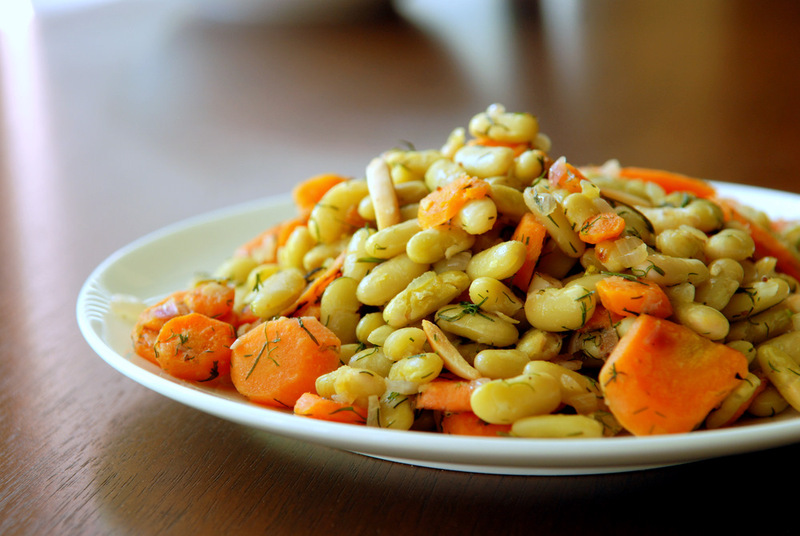 The broth-infused creamy white beans were the definitive star of the salad. If you can’t find flageolets, any white bean could work like great Northern or pinto (Heidi used alubias, a kind of pinto bean). 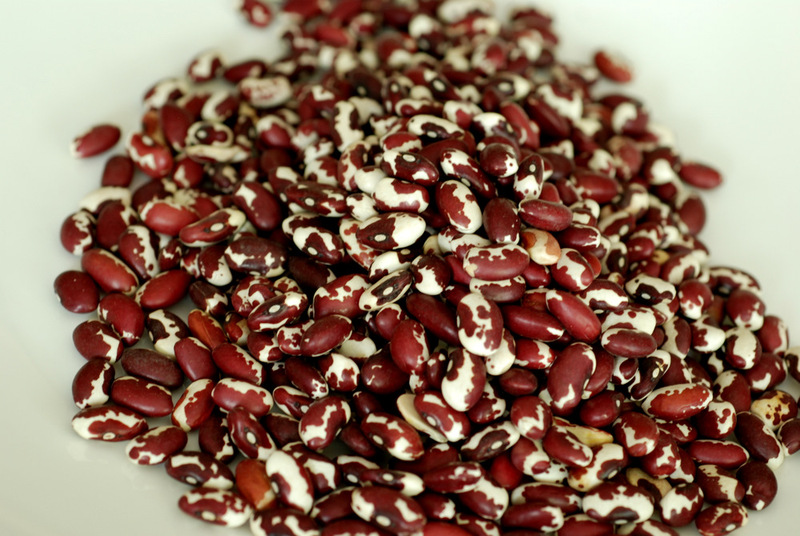 In a pinch, tinned beans could work as well but they don’t brown up as well as home-cooked beans (be mindful that they don’t turn to mush). This salad tastes great fresh from the stovetop but also works wonderfully after a few days when the flavours have melded together even longer. This is my submission to Deb for this week’s Souper Sundays, to this week’s Wellness Weekends, and to this month’s My Legume Love Affair, hosted by Cathy. While I have baked beans in the middle of the summer, during the biggest heat wave of the summer, no less, I actually try not to use the oven in the summer. 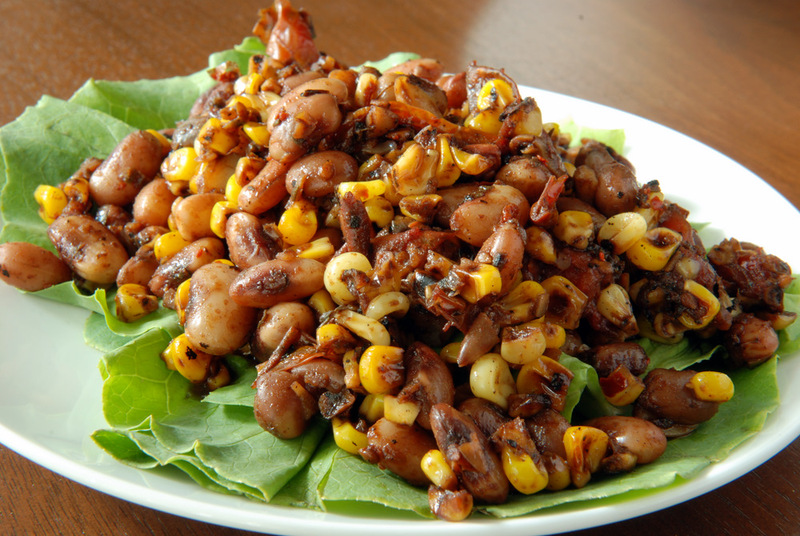 The Mango BBQ Beans, which appeared a few times this summer, were perfect because they were cooked on the stovetop. Why would I want to heat up my home with the oven when I am actively trying to keep things cool at the same time? Since I ate primarily raw while in Iceland (courtesy of a fabulous resto, Glo, right across from our hotel in Reykjavik), I was craving comforting, homey dishes upon my return. Thankfully, I had some meals that I had frozen before we left for vacation, and Rob eagerly whipped up a batch of dal bhat. When my jetlag finally subsided enough that I was ready to tackle the kitchen, I peered into my bean collection, glanced out at my garden brimming with herbs, and figured a light, lemony, baked bean dish was in order. 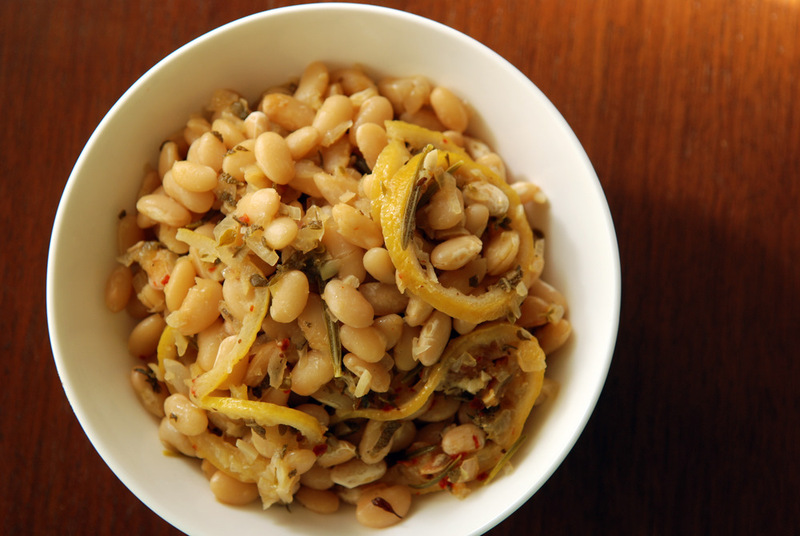 Bright and summery with the herbs and lemon, zippy from the chili flakes, yet comforting with the creamy white beans, this was a perfect dish to throw into my oven on a lazy weekend afternoon. The house smelled great, the kitchen warmed up and my belly was decidedly content. Baking the beans allows a more even cooking temperature that results in creamy beans, but also roasted the garlic and herbs together into a sultry sensation. I modified Kim’s recipe to use the herbs in my own garden and used less oil, but this is completely malleable to whatever strikes your fancy. Pick your favourite herb or herbs. I was a bit perplexed about the baked lemon, but in the end, I kept it with the beans and found I could eat it, too, seeds and all! This is being submitted to this week’s Weekend Herb Blogging, hosted by Astrid from Paulchen’s Foodblog. Sometimes my friends know me better than myself. What did I want for my birthday, I was asked. Nothing! Your company is all that I ask for… honestly! My friends rarely listen to me, though. One of my friends, knowing my love of healthy food, specifically with my pea shoot infatuation, gifted me with some radish shoots. They are some spicy shoots, let me tell you! 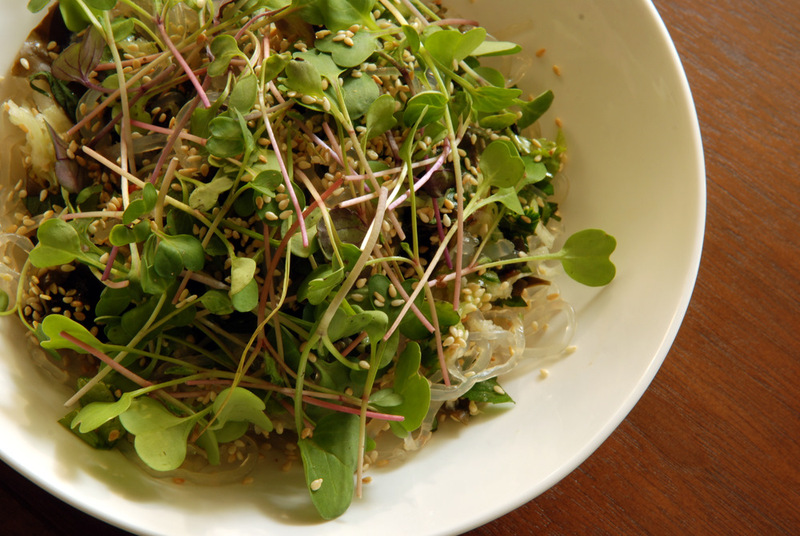 Pea shoots are sweet and mild, but these are feisty. They taste like radish, which to me, is spicy. While you could throw them into any salad, I somehow stumbled upon a recipe that highlighted their spiciness in all the right ways. Found in Plenty, I modified Ottolenghi’s Soba Noodles with Wakame, to try out kelp noodles. While it is brimming with a long ingredient list, including such isoteric items like wakame (and now kelp noodles), the pack-rat that I am, I had everything I needed. Except a second cucumber because two cucumbers seemed like a bit of cucumber overload. However, after the cucumber rested, wilted, and lost its moisture, it condensed to a small mass. I compensated by adding shredded kohlrabi. The mint and cilantro were courtesy of my garden. Just as Rob became cranky as he prepared The New Best Salad Ever, I gradually became cranky as I made this… because I had to destem my wakame! This was such a tedious process, and since I used the entire bag of alaria (a common wakame substitute), I had a lot of destemming to do! Part of my uneasiness was that I was using such uncommon, wacky ingredients that I had no clue how this would turn out. Was it worth the half hour of wakame destemming? By golly geeze, a resounding yes! This salad had me giggling all night with its sheer deliciousness. 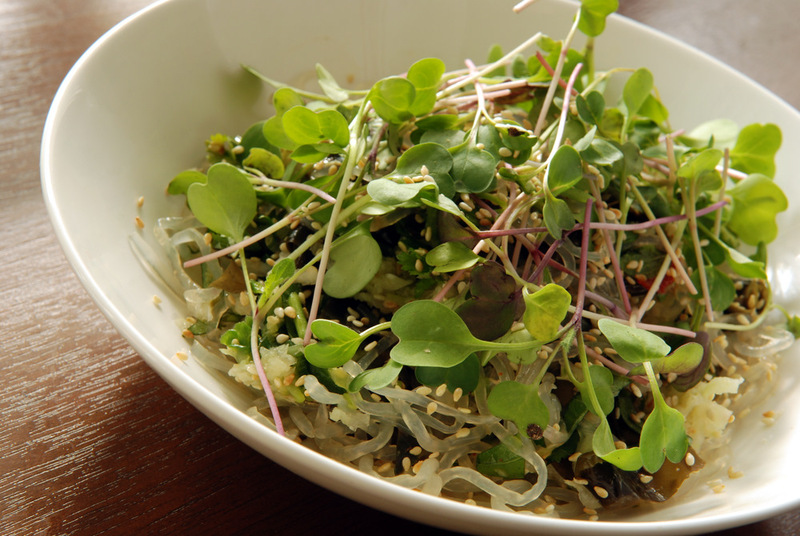 It was light and bright from the lime, sweet but now overpoweringly so, sea-like with saltiness from the wakame, yet with an undertone of spiciness from the chili flakes and radish shoots. 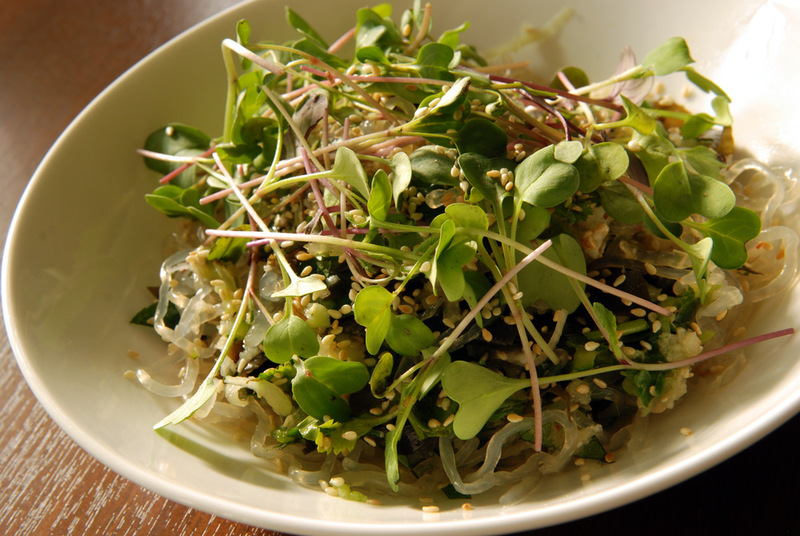 The cucumber and kohlrabi meld well with the slightly crunchy kelp noodles to highlight the sauce. Sometimes I wonder if my palate is changing, definitely less mainstream meat and potatoes, but this recipe from Ottolenghi is a keeper. Soba noodles would be wonderful here as well, as he originally suggested. This is my submission to Deb for this week’s Souper Sundays, to Ricki’s Wellness Weekends, to this week’s Presto Pasta Nights, hosted by Tandy of Lavender & Lime and to this month’s Monthly Mingle featuring Scintillating Salads. How do you bookmark your recipes? Every day I am inundated by oodles of recipes I want to make from other bloggers, from my cookbooks, or just something I whip up in my head (and belly). I know there are applications and websites to help you figure this out, but they have been too cumbersome for me. I am old school. I email myself the recipes and stick them in a searchable folder. The rest, my brain has to take care of, as it remembers what I don’t put into emails. When I can’t find a suitable recipe in my email treasure trove or rack my brain as to what’s in my cookbooks, I will often consult my favourite bloggers. My favourite way to tackle this is through Google Reader, which is a quick and easy way to narrow my search to my blogs of interest. So when Rob and I picked up a dozen ears of corn, I had to scour everywhere for corn recipes. I usually don’t like corn – of the frozen or canned variety. I will actively remove it from recipes (celery gets removed even more quickly) so it was a challenge to do the opposite. Find me some corn delicacies! 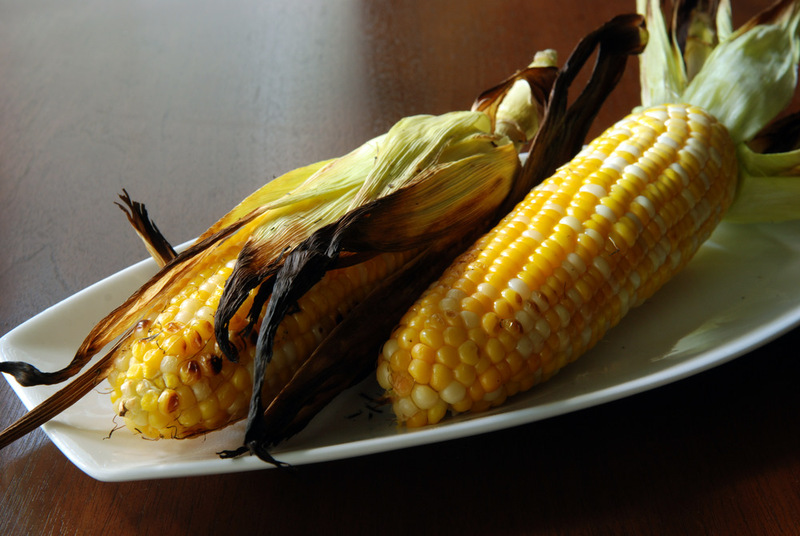 Hopefully the last few corny posts have shown you how great corn can be, from the simple grilled ears, to pan-toasting the kernels for a salad, or boiling the corn to put in a quinoa salad, or as a savoury filling for a cornmeal pancake. 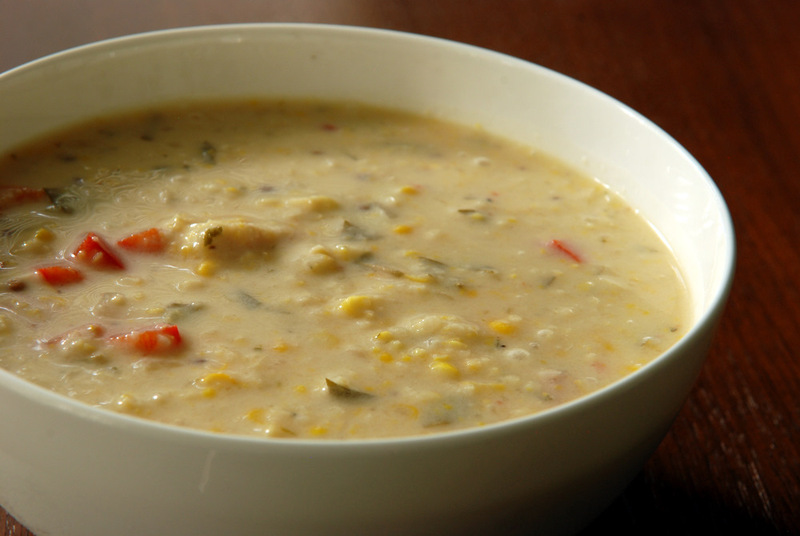 Corn soups are another way to enjoy corn. Trust me, I have bookmarked so many corn soup recipes that I had a difficult time narrowing it down to which I wanted to try. In the end, I thought this Thai Coconut Corn Stew, which Ashley made last year from Eat, Drink & Be Vegan hit it right (recipe also posted here). A soup that could come together quickly despite its long ingredient list. In addition to the coconut milk as the backdrop for the chowder, red bell pepper is added for sweetness. The soup is flavoured with lemongrass, lime, ginger, cilantro and a hint of spice from chili flakes, creating a very complex soup without too much fuss. 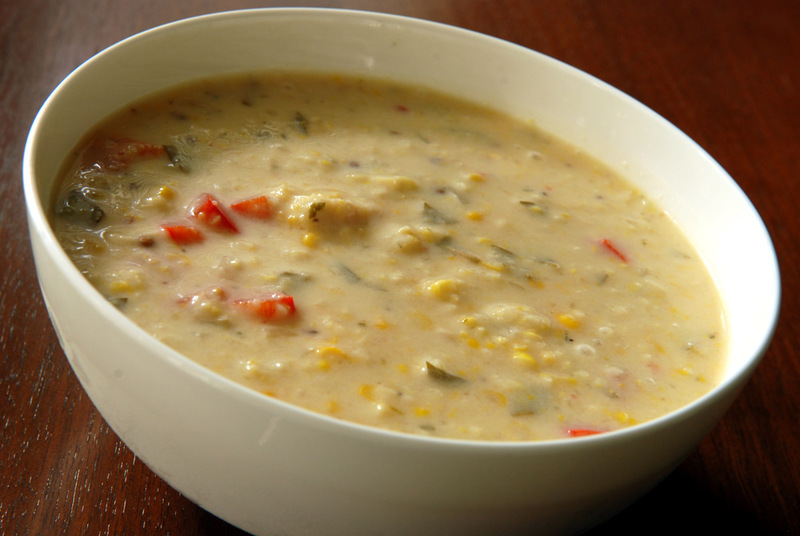 It is nice and creamy from the coconut milk and pureed corn, but also surprisingly light at the same time. Seriously yummy, this recipe is a keeper! This is my submission to Deb for this week’s Souper Sundays, to this month’s Simple and in Season, to this month’s My Kitchen, My World destination Thailand, to Ricki’s Wellness Weekends, to this month’s Bookmarked Recipes, to this month’s Ingredient Challenge Monday for coconut, and to this month’s No Croutons Required featuring home-grown produce. Rob and I just returned from a week-long vacation in Iceland. I hope to do a more complete post in a few weeks about the trip (wonderful! beautiful! stunning! ), after I frantically try to put my life back into order with work and research commitments. My blog will go into autopilot until then. I will tease you, though, and let you know how great the trip was and a week was certainly not long enough for the quaint island. Despite the stunning views and vistas, it was cold. While the daytime highs could be 8-20C, with winds beating us fiercely at 80 km/h, the windshield was brutal. It reminded me how it is truly fall. Even before I left, I knew summer was slowly coming to an end at home. I was worried I would return to Canada to find fall, but instead, thankfully, it is still in the mid-20s. However, there are other signs. The mornings are now dark when I get up and if I cook after work, it can be dark by the time I finish. Butternut squash, a surefire marker of fall, is making a come back! After the cold winds of Iceland, I was hankering some warming stews and soups. Summer or fall, stews are great any time of the year. In fact, this stew doubles as a salad which is how I ate the leftovers. See how perfect this is for end-of-summer meals? 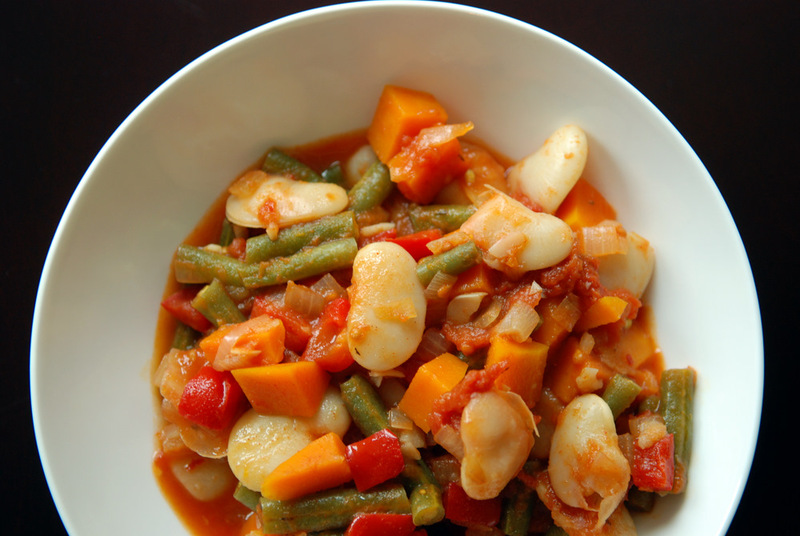 Adapted from Moosewood Restaurant Cooking for Health (recipe posted here), this is a flavourful medley of vegetables (red bell pepper, green beans, tomatoes and butternut squash) with a light broth spiced with sweet paprika. Spurred by Cara’s recommendation, I used butternut squash instead of sweet potatoes but both would work well here. 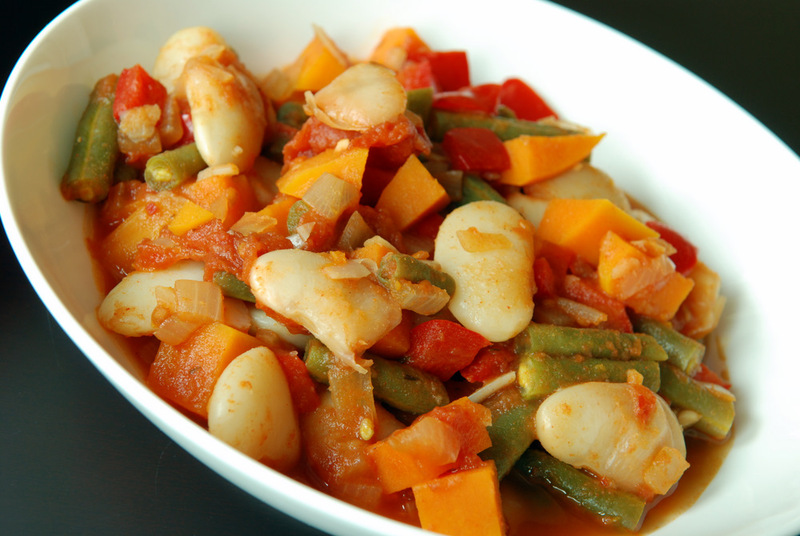 This is great with the large, buttery lima beans, but feel free to use your favourite bean. Moosewood recommended serving this with a romesco sauce on top, but I found I preferred the thickened leftover stew over top baby spinach with a sprinkle of toasted slivered almonds. 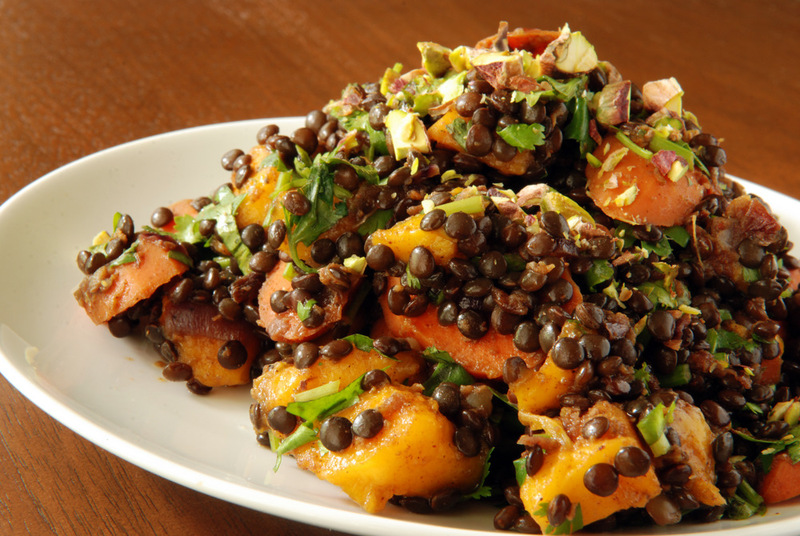 After throwing my sweet and sour lentils overtop arugula, I am learning that most bean dishes can be thrown overtop some greens for a lovely salad. This is being submitted to this week’s Weekend Herb Blogging, hosted by Graziana from Erbe in Cucina (Cooking with Herbs). My family only recently discovered quinoa. I’d like to think I am to blame, but I know it is only partially due to my fondness for whole grains. According to my sister-in-law, quinoa is the new couscous. 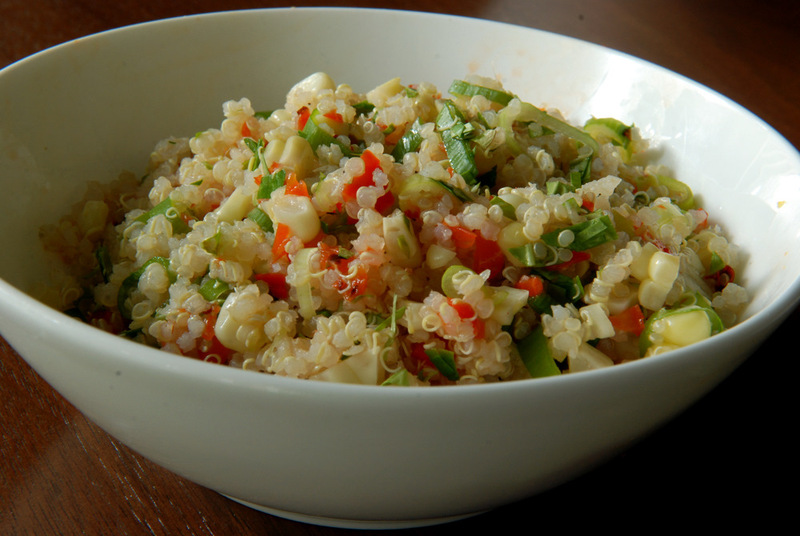 She went to a multitude of barbecues this summer and quinoa salads were always a star. What’s not to like about the fluffy pebbles? I often use quinoa as a simple side to a stir fry or curry. Anywhere you’d typically think of rice, quinoa can substitute as a quick-cooking grain. Other times, I will use it as a base for a salad, as I find it works well with Mexican flavours. While my family has been smitten with quinoa, they have had a hard time figuring out how to cook it properly. I typically cook it in twice the amount of salted water for 15-20 minutes until all the water is absorbed, and then plop the lid back on for an additional 5 minutes to let it steam. For some reason, this doesn’t work for my mom. I will conceded that yes, her quinoa was more on the mushy/goopy side. I encouraged her to try to toast it first, to use less water or to steam it instead. For her last quinoa salad, with oranges, black-eyed peas and mint, she tried the steaming method with a fine mesh strainer inside a pot of boiling water. Now she had perfectly plump quinoa! It really is a simple way to get better texture from the quinoa and I should really try it more often. The benefit of boiling it is that I can infuse the quinoa with flavour if I use vegetable stock, herbs or other spices. 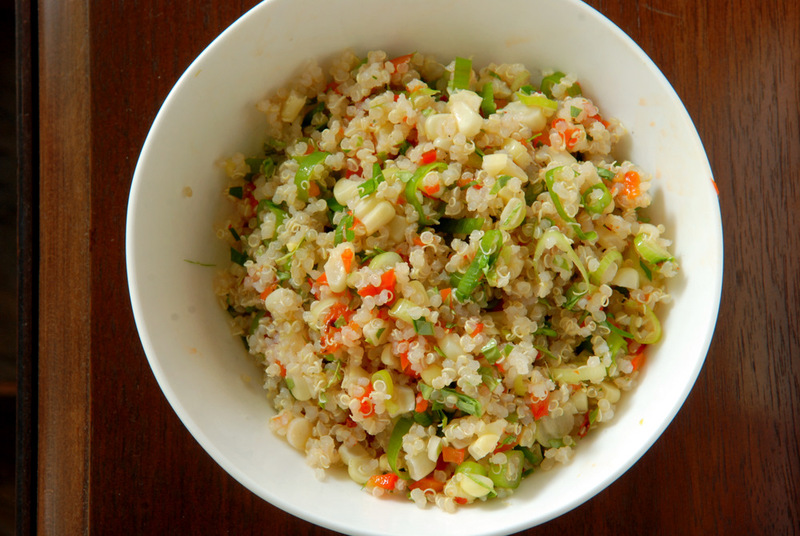 Need a delicious salad to inspire you to try quinoa? 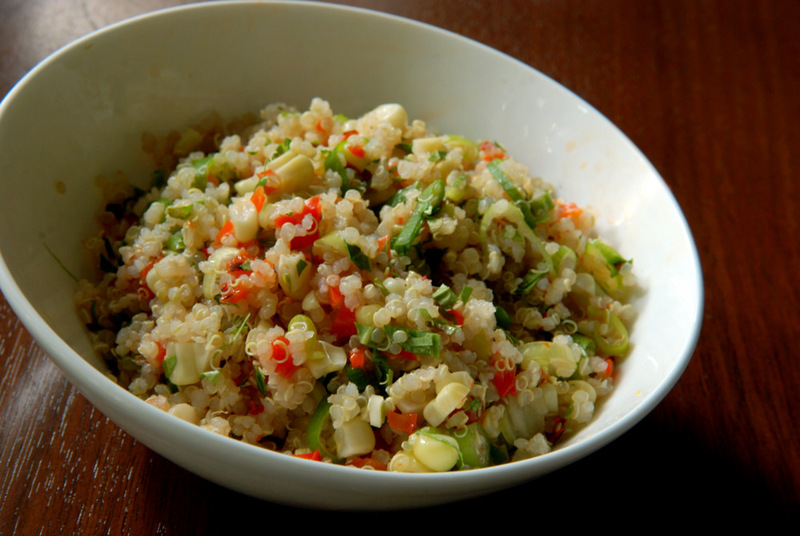 Try this Mexican-inspired lime-cilantro quinoa corn salad that I adapted from Ashley at Eat, Me, Delicious, who modified it from Rebar. It is a light, bright salad brimming with flavour. While I don’t usually add corn to salads, the sweet corn was the perfect accent to this salad. It melds well with the the quinoa, that is speckled with a red pepper that I had grilled on the barbecue with some oil and garlic. Green onions add a nice sharpness and the chili flakes give this a bit of a zip. 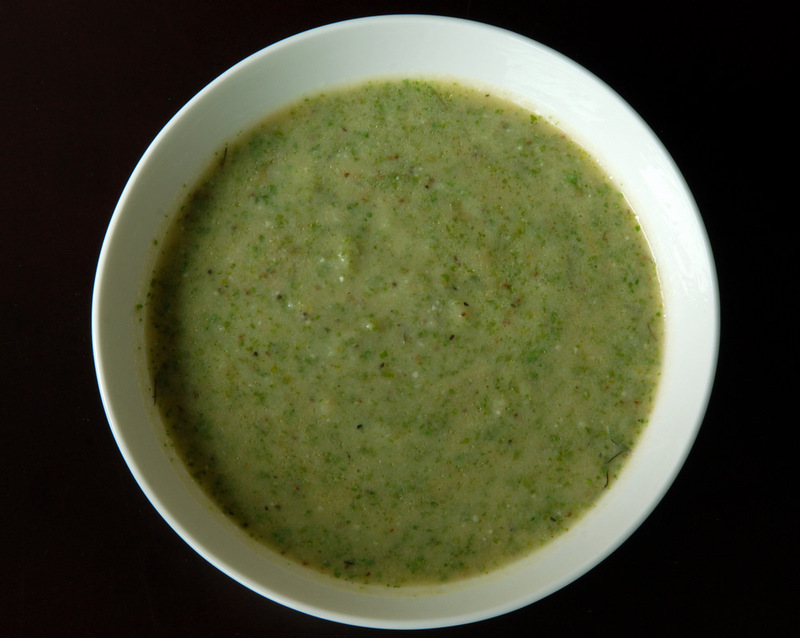 Cilantro is the herb of choice that pairs well with the fresh lime juice. I love the acid, but if you don’t, feel free to tame it by adding some oil. I also found that I really liked adding whole golden flax seeds to the salad. They were camouflaged amongst the quinoa, so you can’t really taste them, but they add extra nutrition – healthy omega fats and fiber. Completely optional, but if you are the adventurist, healthy type, go for it! This is my submission to Deb for this week’s Souper Sundays, and to Ricki’s Wellness Weekends and to this month’s Monthly Mingle featuring Scintillating Salads. 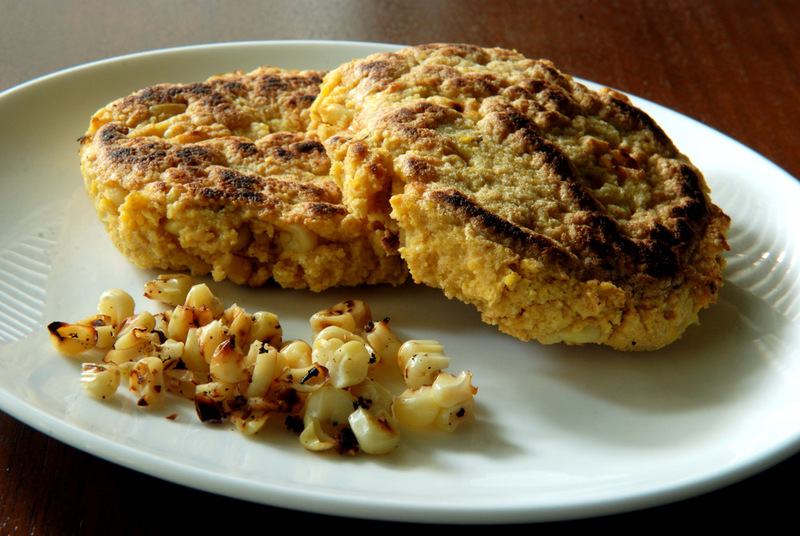 Buying a dozen ears of corn on impulse means lots of corny recipes! I already knew this was going to be the year of the bean, but I have been slow on trying out my heirloom beans. I have a hard time using up an ingredient that will be nearly impossible for me to replenish. 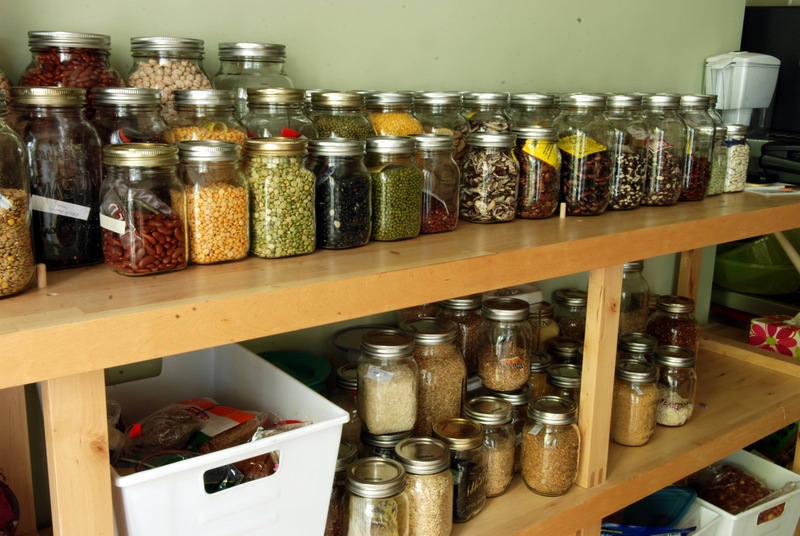 But after reorganizing my kitchen into a virtual bean library with rows of Mason jars housing my beans, it became apparent just how many beans I have! Lots! And I should really start to cook with them. It will be ok, even if I love them to bits. It will just give us an excuse to wander back to New York or San Francisco. Imagine how excited I was to find a salad for both corn and heirloom beans. Martha called for Jacob’s Cattle Beans. I went downstairs to soak them. Except I couldn’t find Jacob’s Cattle Beans. 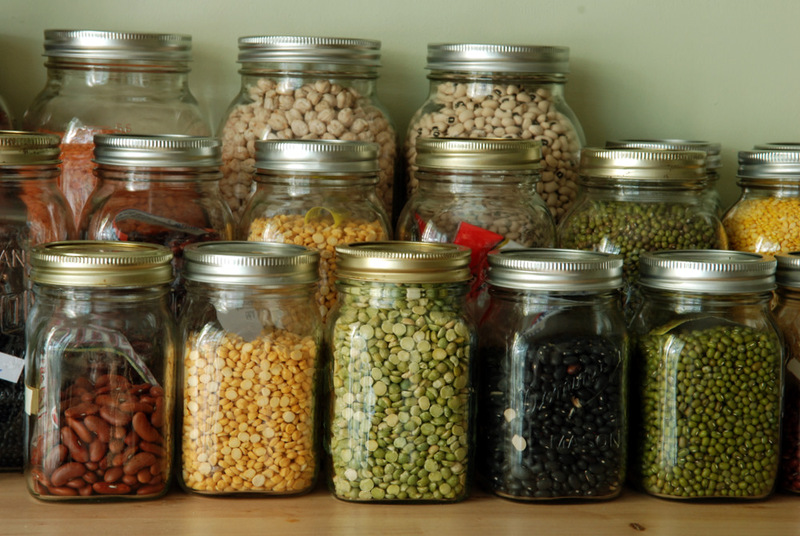 My beans are organized by use, and the heirloom beans by colour… not alphabetically. I scoured my list of beans I bought from Kalustyan’s and turns out I don’t have Jacob’s Cattle Beans. Drats! I googled a bit and figured Anasazi beans could substitute as they are a sweeter, mealy bean similar to Jacob’s Cattle Beans. Colourfully dappled when dry, they sadly loose their fun colours after cooking. Anasazi beans are quick cooking, and apparently don’t need any pre-soaking (although I did anyways). Pinto beans could easily substitute if you are heirloom-less. Now that we had our bean selection under control, I got the beans simmering the next afternoon. Each component of the salad was meant to shine, so meanwhile, I toasted the corn kernels in a skillet over the stovetop. Next, I cooked down some cocktail tomatoes with thyme. I tried to cook the tomatoes in a non-stick wok without oil but they stuck anyways. If you add oil it may not be a problem for you, but to capture all those browned bits, I deglazed the pan with some the broth from the cooked beans. I threw in the beans and corn to help meld the flavours. The dressing was simple, with balsamic vinegar, olive oil, chili flakes and salt and it rounded out the salad nicely. 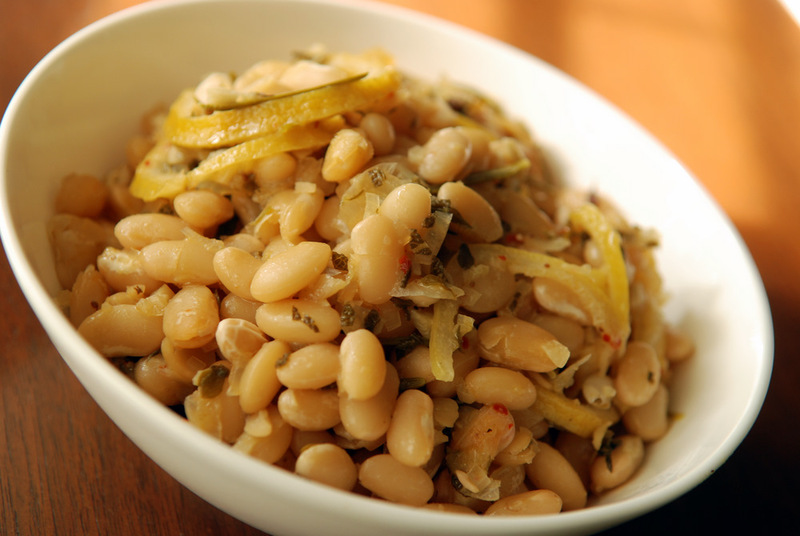 Served on top of your leafy green of choice, you have a typical one-pot Janet bean salad. This is my submission to Deb for this week’s Souper Sundays, to Ivonne at Cream Puffs in Venice for this week’s Magazine Mondays, and to this month’s Monthly Mingle featuring Scintillating Salads. I had a sense of deja vu this weekend. But not in the typical I’ve already done this sense. Rather, a ‘why haven’t I learned my lesson yet’ kind of deja vu. We visited friends in Horseshoe Valley for a weekend filled with friends, food, games, adventure park fun (o-go ball is highly recommended) as well as a trip to the beach. While I am not too fond of beaching, I was excited when my friend, Greg, suggested we bike to Wasaga Beach instead, which was 45km away, he said. Rob checked: it was 27km away. While Rob and I haven’t done many long-distance cycling trips since our big adventure to Kingston, 27km would still be a quick stroll for us. An hour, maybe an hour and a half, I told myself. We packed light for the trip, with just a couple bottles of water. Our snack would be waiting for us at the end, at the beach, when we would arrive for an early lunch and meet up with the girls. We could easily cycle back, too. Greg, our fierce leader, wasn’t keen on cycling back. OK, no problem. As soon as we pulled out, I was reminded that this may not necessarily be as flat as I had predicted. We were starting at the bottom of the valley. We only could go up! Greg suggested taking smaller side roads to circumvent the huge hills on Horseshoe Valley Road, which we thought was a fabulous idea. We twisted up the side roads and meandered through lovely rolling hills. After 13km, I needed a break and nonchalantly stated we were half-way to the beach. Not so. Rob, plotting our progress through GPS on his phone, said we were now further from the beach than when we started! I’ll spare you the details, but yes, we had lots of rolling hills with challenging uphills. The wind was fierce. We added detours to forgo traffic-heavy roads. I broke out my emergency larabar. Thankfully, the last 15km was mainly flat, maybe slightly downhill to the beach. The flat 27km bike ride ended up being a very hilly, very windy 57km. We were greeted by a mild sand storm at Wasaga as the strong winds pushed sand around ruthlessly. Greg still jumped into the lake, cycling clothes and all. We arrived for a late lunch. The girls had already eaten without us and warned us there was probably sand in the sandwiches. 😉 My quinoa salad had fared a bit better. Steph made delicious vegan cupcakes for dessert – matcha green tea with marzipan flours. It had been a while since I had a cupcake yet I devoured it for dessert. Sometimes crazy cycling can do that to you! It was on the way back home that Rob and I picked up the corn on impulse. Where else would we get such freshly picked corn? When we got home, Rob started the barbecue and began grilling the corn for dinner. I had a hankering for baked goods and used corn to make these corny pancakes from Ricki. 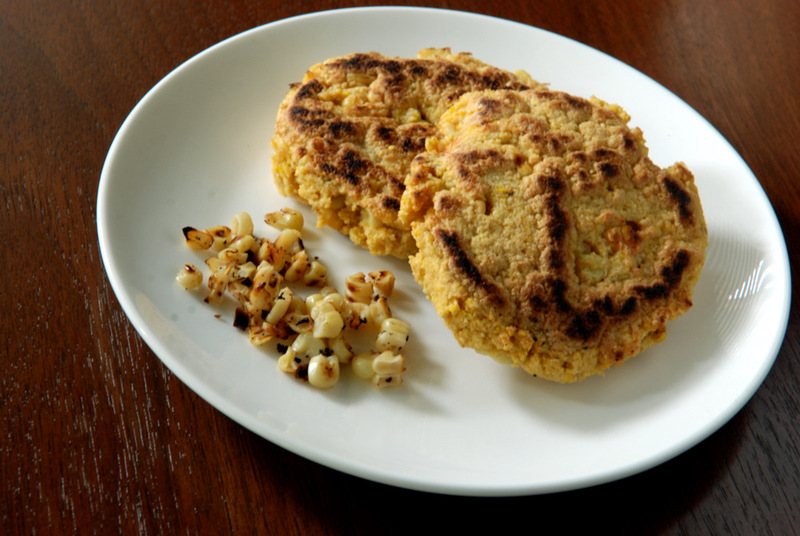 Using three different forms of corn – fresh corn kernels, corn meal and corn flour (masa harina) – these are a seriously corn-stuffed pancake. With corn as the flour base, it was reminiscent of a sweet polenta. Flavoured with both vanilla and lemon, it was an exotic twist. Slather it with Earth Balance for pure simple bliss, or top with your favourite compote or salsa. This is my submission to this month’s Simple and in Season. There is only one time of the year I will eat corn. Now, when I can buy local corn picked that morning. As corn sweetness degrades by the hour after picking, it is best to buy fresh and to eat it soon after. Just like fruit, fresh sweet corn is best with minimal adornments. At the party, because the barbecue was hot real estate, I opted to boil the corn. But this weekend, when Rob and I bought a dozen ears of corn, we wanted to try to grill the corn. For such a simple procedure, even boiling corn, everyone has their preferred method. When is boiled corn ready? When the water turns yellow… Just take it out after 10 minutes… Instead, I went with Rob’s aunt’s advice to take it out after you could pierce it easily with a knife. Nicely done. The corn was so sweet, no butter or salt was needed. For grilling the corn, there are also numerous ways to tackle the job. If you want to keep your kernels juicy and plump, grill it with the husk intact. If you want it more dry and charred, grill it with the husk removed (check out this video by Mark Bittman). This time, Rob and I experimented. We soaked our corn, dehusked the corn (or would that be husked the corn? ), then removed the silk. You can then grill them, unadorned, with a hint of that smokiness from the barbecue. Or, go slightly more upscale with your favourite flavourings. Here, we tried a delicious garlic-rosemary grilled version from Ashley at the Edible Perspective. We mixed together some olive oil with minced garlic and fresh rosemary, slathered it on the corn, re-wrapped the husk around the corn and grilled away. Plump, juicy corn with garlic and rosemary infused right into the corn. 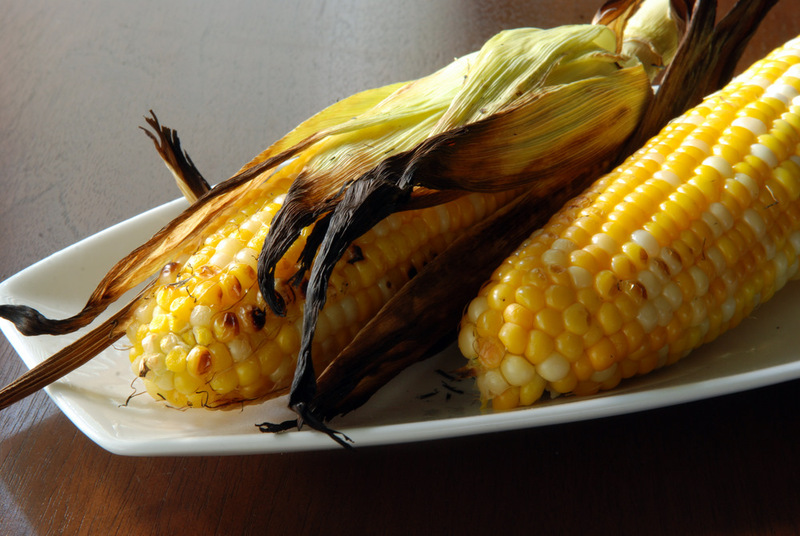 What are your favourite flavour combinations with grilled corn? This is being submitted to this week’s Weekend Herb Blogging, hosted by Simona from Briciole. I thought I had been curried out, but in truth, curries have now infiltrated my life. I made a curry without even knowing! As I was cooking it, Rob walked into the house and proclaimed it smelled like curry. It must have been the garam masala. Should I call this a Moroccan curry or a salad? 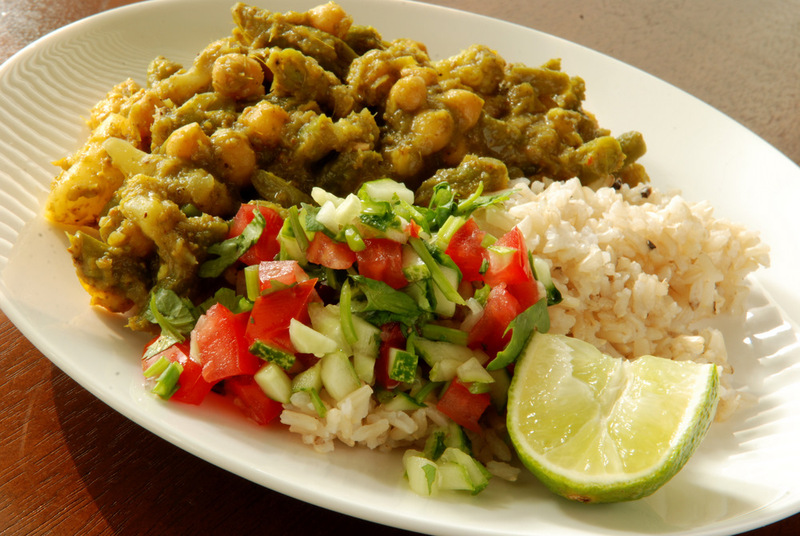 How about a curried salad? (I am no stranger to renaming things as curry, as scary as it may originally appear). 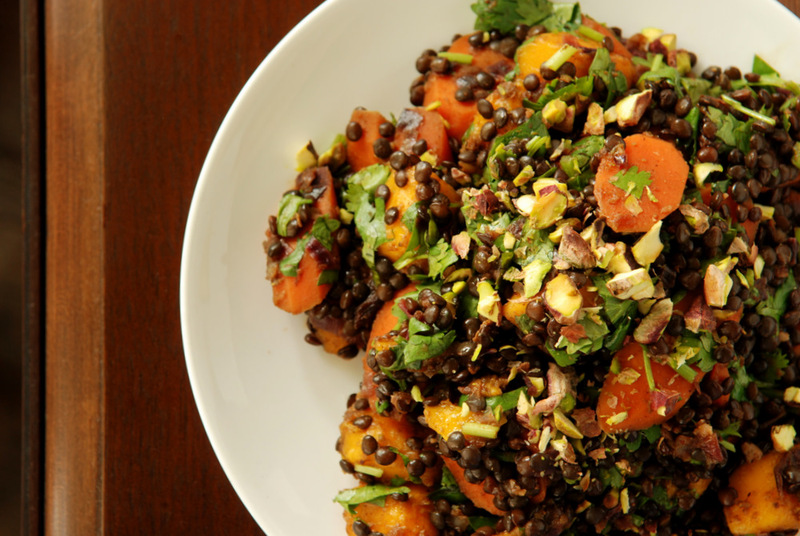 It is kind of an Indian/Moroccan version of my Latin-Spiced Mango Lentil Salad. Maybe Moroccan fusion cuisine would better describe this dish. I have to call it Moroccan, though, because I found the original recipe for stir-fried carrots with mango and ginger in Moroccan Food & Cooking by Ghillie Basan. Of course, I took it into my own direction. I opted for a longer braise for the carrots, to give them a nice caramelization. Then I added lentils, to make this a more substantial dish. In retrospect, couscous (or millet) would have kept this more aligned with its Moroccan routes. I didn’t have ras el hanout, so I substituted garam masala which has a lot of similar spices. Regardless of its name, the end result was a delicious warm lentil dish, filled with caramelized carrots and onions, with heavy savoury notes from the cinnamon with more complexity from the garam masala. Ginger adds a subtle, but nice heat. Mangoes add the finishing touch, as well as a squirt of fresh lemon juice. If your mangoes aren’t ripe, you may consider adding some agave or honey to the dish. 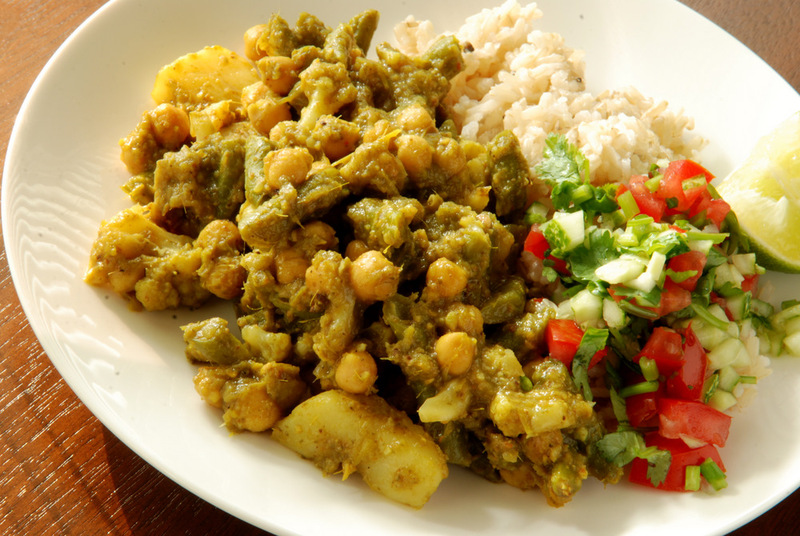 What are your favourite curries? This is my submission to Deb for this week’s Souper Sundays, to this month’s Simple and in Season and to Ricki’s Wellness Weekends. 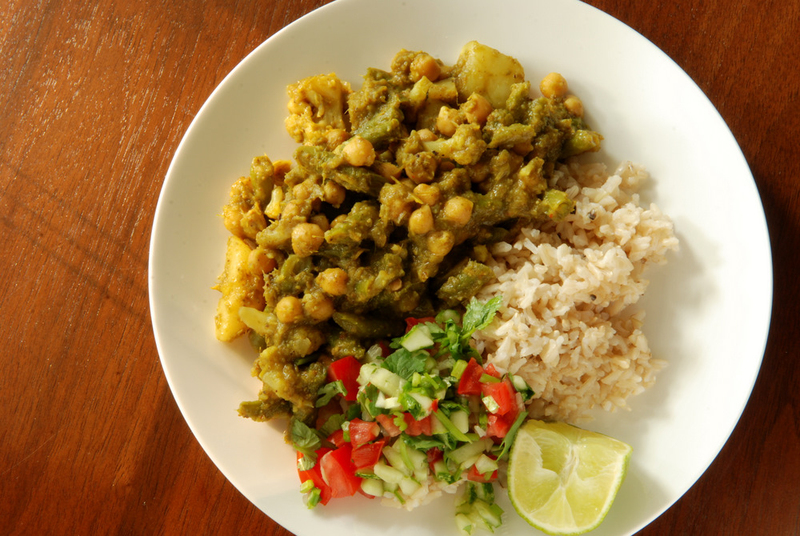 The fourth curry this week… I am almost getting curried out! I have never seen Rob so excited about trying a new recipe. I was browsing through my newest favourite cookbook, For The Love of Food, and I spotted a recipe that seemingly used up a lot of the odds and ends in our fridge. Massaman curry, have you heard of this, Rob? Would I like it? Turns out it was his favourite curry while travelling in Thailand. However, as we made the curry together, Rob quickly realized this wasn’t the same Massaman curry he had eaten overseas. The sauce had coconut milk, lemongrass, cardamom, cinnamon and ginger, but no peanuts. No fish sauce nor tamarind. After slaving and salivating in the kitchen for a while, Rob felt let down when he taste-tested it the first time. The vegetables were good, but the depth of flavour was lacking. He ended up adding all of the spice mixture, as the recipe only called for a couple tablespoons of the mixture. After which, when I tasted it the second time, I told him I wouldn’t be able to eat it for dinner- it was now too spicy! Those peppercorns were likely the culprit but thankfully, it didn’t have that ominous “curry” flavour. Since I had adored Cotter’s previous recipes, we still trucked on with making the cucumber and coriander salsa. Rob finally sat down to eat it, served with the salsa and rice, with a drizzle of freshly squeezed lime juice. The more he ate it, and accepted it as a non-Massaman curry, he grew to enjoy it. I then decided to give it a go with the salsa and lime. While Cotter may have misled us by calling this a Massaman curry, he also said this curry was best with the cooling salsa, and there he wasn’t lying. It definitely made the dish go from something I refused to eat, to something that was genuinely spectacular. Another Janet-sanctioned curry, this time hailing from Thailand. I am definitely realizing that more complex dishes, where each component is outstanding on its own, can be brought to high levels when combined. The only problem is that it makes for a kitchen filled with lots of dirty dishes. Gah! An authentic Massaman curry is still on our to-do list, though. But whatever its name, this curry is the bomb, just don’t forget the salsa! This is my submission to this month’s Veggie/Fruit a Month, featuring cauliflower, to this month’s My Legume Love Affair, hosted by Cathy, to this month’s My Kitchen, My World destination Thailand and to Ricki’s Wellness Weekends.